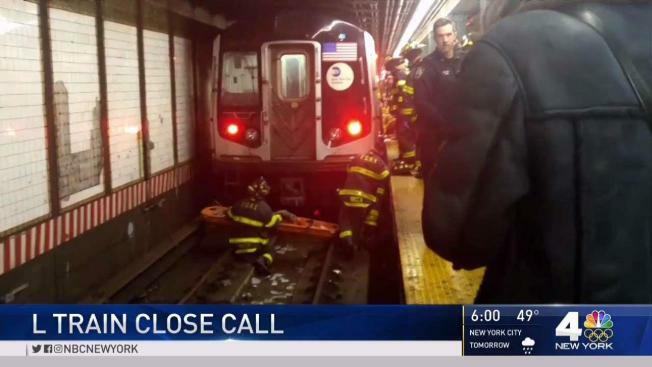 The scene stunned subway riders in Brooklyn: a woman falling onto the tracks as a train pulled into the Bedford Avenue station. She was trapped under the train but miraculously, survived with only minor injuries. Ida Siegal reports. A 22-year-old woman miraculously escaped serious injury when she passed out and fell onto subway tracks in Brooklyn just as a train pulled in, officials and witnesses said. A photo shows the woman wedged underneath the train holding the hand of an MTA construction worker at the Bedford Avenue station in Williamsburg Thursday morning. The Manhattan-bound L train apparently missed her as she got jammed between the rail and the wall. Witness Steve Coyle saw the woman fall as if she had just misstepped. "She didn't seem aware that she was going to fall," he told News 4. "She just sort of walked and went straight down." The train somehow missed the woman, but she was trapped underneath, waving her hand between the wheels of the train, said Coyle. "People screamed and ran," he told News 4. "I think we all assumed that she died at that moment." An MTA worker held the woman's hand and kept her calm as firefighters worked to get her out. They removed her about 20 minutes later, putting her on a stretcher and taking her to the hospital. "After they got her out, the train pulled out, there was no blood on the tracks, there was nothing — it didn't look like anything really happened at all," said Coyle. "So I'm guessing she fell and got lucky enough to fall right between the tracks." Fire officials said she had minor injuries.